A United Launch Alliance Atlas V rocket carrying the classified NROL-52 spy satellite for the U.S. National Reconnaissance Office stands atop a launchpad at the Cape Canaveral Air Force Station in Florida for an Oct. 14, 2017 launch. Calling all early-bird space fans! Two rockets — one Russian and the other American — will launch on two very different missions early Saturday (Oct. 14). You can watch both launches online, but you'll have to wake up in the wee hours to do it. 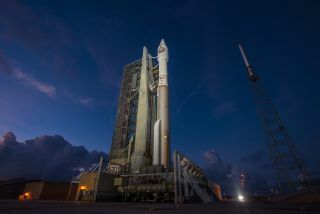 The space action starts at 3:31 a.m. EDT (0731 GMT) with the launch of a classified U.S. spy satellite on a United Launch Alliance (ULA) Atlas V rocket from Cape Canaveral Air Force Station in Florida. Then, at 4:46 a.m. EDT (0846 GMT), a Russian Soyuz rocket is scheduled to blast off from Baikonur Cosmodrome in Kazakhstan carrying the uncrewed Progress 68 cargo ship filled with supplies for the International Space Station. You can watch the back-to-back launches live on Space.com here, courtesy of ULA and NASA TV. ULA's Atlas V launch webcast will begin at 3:11 a.m. EDT (0711 GMT), followed by NASA's webcast at 4:15 a.m. EDT (0815 GMT). Both missions launching Saturday were previously delayed due to one issue or another. ULA initially tried to launch the Atlas V mission on Oct. 5 but was delayed several days by bad weather. Then, a telemetry transmitter issue pushed out the launch another week. The Atlas V rocket is launching the classified NROL-52 spy satellite for the U.S. National Reconnaissance Office. The mission follows the launch of another clandestine satellite by ULA, the NROL-42 mission, from California's Vandenberg Air Force Base on Sept. 24. The first launch try for Russia's Progress 68 cargo ship occurred Thursday (Oct. 12), with the Russian Federal Space Agency (Roscosmos) aborting the mission at the last minute due to an unspecified issue. That issue was apparently resolved Friday, allowing for a Saturday launch attempt, according to a NASA update. A Russian Soyuz rocket carrying the Progress 68 cargo ship is readied to launch from Site 31 at Baikonur Cosmodrome, Kazakhstan. Liftoff is scheduled for Oct. 14, 2017 after a two-day delay. Progress 68 is carrying nearly 3 tons of food, fuel and supplies for astronauts and cosmonauts living on the International Space Station. The spacecraft is expected to arrive at the station Monday (Oct. 16) after making 34 orbits of Earth. Roscosmos initially hoped to try a new ultrafast rendezvous plan, which would deliver Progress 68 to the space station in just 3.5 hours, on Thursday. But the launch delay required a more typical two-day flight due to the orbital mechanics involved to reach the orbiting laboratory, NASA officials said. The launch delay for Progress 68 has forced NASA to reschedule an upcoming spacewalk for two American astronauts on the space station. That spacewalk, originally scheduled for next Wednesday (Oct. 18), is now set for Friday (Oct. 20). NASA astronauts Randy Bresnik and Joe Acaba will take part in the spacewalk to perform maintenance tasks on the station's exterior.